Golf and writing are two of my greatest passions (sorry, honey). 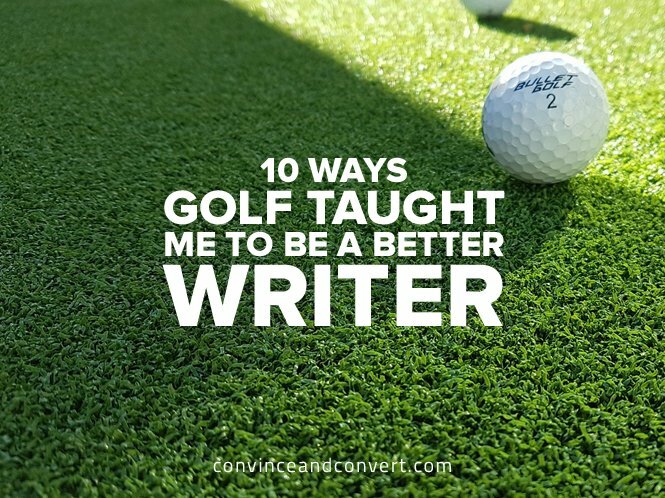 You may not see it on the surface, but writing and golf happen to have a lot in common. Each can make you want to quit at any second, but each can just as easily remind you why you torture yourself for the craft in the first place. I’ve had plenty of time to think on these connections (sometimes too much during the slow or trying rounds), and it’s given me some valuable insight into both golfing and writing. Here are 10 pieces of golf advice that will help you better yourself as a writer. It’s worked for me! Golf is a game of precision and accuracy. If you’re serious about your game, every stroke you take requires careful consideration. Misjudging a single shot can mean the difference between a successful round and a disappointing one. You can do one of a couple things. You can step up and hit the ball without any thought. You might free your mind up a bit, but we make the most mistakes when we rush. On the other hand, you can think through every possible shot until you start to overthink it. Once you finally address the ball, you’re so deep into your own head that you end up making a mistake. The key to avoiding mistakes lies in your routine. Every golfer has a routine that they develop over time until it’s pure muscle memory. For me, I survey the shot, choose the club and shot style, take a half swing, then full swing, address the ball, and then take my shot. There’s no room or time for second-guessing. Trust your instinct, and more often than not, you’ll put yourself in a position to succeed. Writing is similar. You put yourself in a tough position when you overthink or underthink a scenario. Once you find your rhythm, you’re golden. One of the hardest things to do in golf is play well in a course completely new to you. The greens roll differently, the distances are tough to gauge, and you’re not privy to any of the course secrets. It’s kind of like finding your way to a new friend’s house without a map (Google Maps doesn’t count): You’ll get there eventually, but it may take you down a bumpy road or two. Read up on blogs and comments. Hang out on industry forums, Facebook groups, and LinkedIn groups. Decipher the most common questions or pitfalls and be sure to answer them. You’ll begin to pick up on what works and what doesn’t, just like you pick up on the speed of the greens after a couple holes. Courses only get easier the more you play them. You learn their nuances and find the best way to approach each section. As you get to know your target audiences, you’ll know which approaches work with them as well. We all want to be the best at what we do. Too often, though, we get caught up in the pursuit of perfection, when we should be more concerned on the improvement and betterment of our craft. “The best lesson I’ve learned in both golf and writing is that—like most things in life—there is no ‘perfect.’ Just as a golfer can’t hit every shot directly into the hole, a writer simply can’t pen the best possible word in every situation. What separates the best in each endeavor from everyone else is their ability to accomplish this just a small percentage more often than their peers. Nicklaus and Woods got the ball into the hole in fewer strokes than anyone, just as Twain and Hemingway chose the right word most often. With that said, remember to proofread. There may be more than one way to turn a phrase, but there is only one grammatically correct way to write each phrase. Any deviation from your positive mentality, however small, can have a disproportionately negative effect on your success. It throws off your rhythm and your mental preparation—both of which need to remain razor sharp. If you envision yourself taking a bad shot, more than likely you’ll replicate that in practice. Writing follows a similar distribution to golf, but I think it’s 90% mental and 10% ability—there is no luck when it comes to writing. When you get in a rut and the words just aren’t flowing for you, take a breath and step back for a moment. No one produces their best work when they’re frustrated or angry. The purpose is simple: You can’t make a putt if the ball doesn’t make it to the hole. If you can get the ball past the hole, you’re at least giving yourself a chance to succeed. The worst thing you can say at the end of the round is, “What if?” Don’t leave yourself in that position. The same adage can be said for writing. With everything you write, take that extra step. Get that extra quote, or take the extra time to re-read and edit your article. If you cut any corners or leave even a little left on the table, your end product will suffer, and people will notice. Golf is an unforgiving game. I can shoot the best round of my life one day then go an entire round without making a par the next day. It happens more than you know. It’s what I love about the sport though—there’s always a next round. Writing is the same for me. This could be my best article yet, but when I start the next one, I may not have the same cohesive thoughts or steady flow. That’s the beauty of writing—even when you struggle, you can come back tomorrow and start fresh. I’ll warn you: Neither craft is for the faint of heart. You’re going to take your lumps and have to work through them. You’ll understand why we put ourselves through it though when you come through with that great round or article. I’ve played countless rounds of golf in my lifetime, and the one constant in all of my best rounds has been my success at the little things. Those things can be anything from reading greens to club selection to shaping my shots. Regardless of how insignificant certain things seem, they are magnified when it comes to golf and writing. Both crafts sport such small margins for error that even one small miscue can ruin a great day. If I misjudge the speed of a putt, even by a hair, I could be looking at a difficult five-foot return putt rather than five inches. In writing, one spelling mistake or incorrect word choice can be the difference between a great article and one that people scratch their heads at. It’s easy to focus on the big picture, but the best at their crafts are the ones that can master the finer details. Like I said earlier, we all have our bad days. You may play great one day and horribly the next, but you must always remember to have fun. It’s a struggle when nothing is going your way (I know that feeling all too well), but that doesn’t mean the day is a wash. Take solace in the few good shots you make or the company you’re with. Golf is a challenge for anyone, but it should be a fun challenge. Writing is the same. It’s not going to come easy every day, but if it’s something you enjoy doing, then you can find ways to enjoy yourself. Nearly every round, I’m presented with a shot or two that leaves me with two options: play it safe, or take a chance. I can play it safe and maintain my score, or I can go for it and risk swinging my score a stroke or two in either direction. Say I fire my tee shot into the woods and have two resulting shots: a punch out for an easy third shot into the green or an opportunity to hit between several trees and land my second shot on the green. For amateur players, it’s easy to want to take the creative shot, but nine times out of 10, that’ll leave you in a less advantageous position than you would be having taken the easy shot. Writing is similar. It’s often the simpler path that leads to a more prosperous result. You don’t always need those big words or extra paragraphs to get to your final destination. You need to focus on the big picture and how that one shot or phrase can dictate your success. All skills are developed and enhanced by repetition. You won’t wake up one day and magically become a great putter, just like you won’t magically master the nuances of the English language. These things take time to develop, and that all comes with practice. I started golfing when I was 13 years old and started taking my writing more seriously about six or seven years later. It was then that I started to see all of the parallels between the two. Neither craft is easy, nor will it ever be, but these pieces can help you improve your own writing style and approach to writing. They did for me!